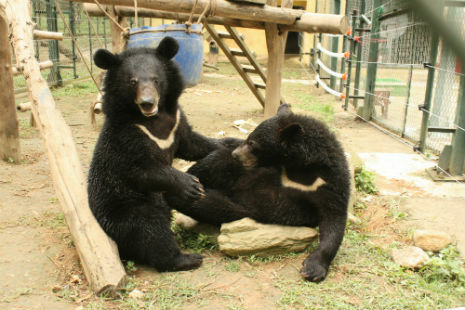 With juveniles Dung and James becoming the latest addition to the Animals Asia family last week, a community of younger bears is beginning to form at our Vietnam Bear Rescue Centre (VBRC). Dung and James follow fellow youngsters Misty, Rain, Joey and Ricky to the sanctuary and the group of bears are already being called “The Moon Bear Cub Pack”. Ricky and Joey arrived at the VBRC back in September 2012. 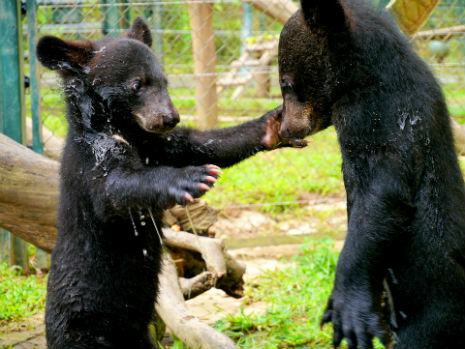 Discovered by Vietnamese authorities in the process of being trafficked in the northern province of Lai Chau, Chinese bear bile farms were the most likely destination for the four month old cubs before help arrived. From there it was a 12 hour journey on flood hit and mountainous roads back to Animals Asia’s sanctuary in Tam Dao. Two years later and those playful little kids are now mischievous teenagers who are ready to get social with some more moon bear company. Misty and Rain have had people swooning over them ever since they arrived at the sanctuary. With names inspired by the testing weather conditions during their journey from Lai Chau province to the VBRC in Tam Dao, these two stole the public’s hearts when a video of them discovering a tub of bubble bath was released by Animals Asia staff. 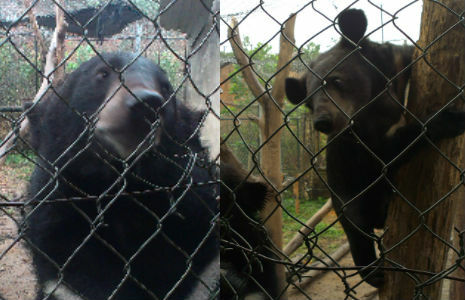 When they arrived at the sanctuary, Misty and Rain weighed only 3kg each. Fast forward 10 months and the pair have thoroughly outgrown their mini enclosure, weighing in at 50kg apiece. Welcome to the latest addition to the Animals Asia family. Having been rescued from Thanh Hoa province just last week, the siblings woke up on Monday to a whole new life in our sanctuary. While both bears are currently in quarantine and the health of James – who has previously suffered sickness and requires an operation to remove cataracts – is being constantly monitored, our staff remain hopeful that the latest additions will one day be integrated into the wider population.